Looking for a nice stay? On the Spanish Maresme coast, 40 minutes above Barcelona is a large and comfortable villa with a view over the sea. For the lovers of sun, rest, food, sports and sea this house is ideal. Approximately half an hour from Barcelona, in Garraf National Park, you will find a unique place on the sea. 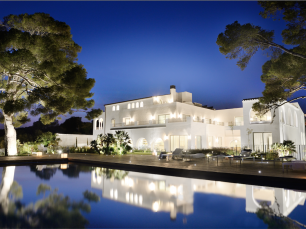 This is Casa del Mar, a paradise being built originally in the fourteenth century as a rural farmhouse. Villa Muntalmar is a beautiful spacious villa with spectacular views and a beautiful garden. This villa was originally designed by a famous architect for his own family home and has recently been completely renovated. There was even a zip line! Just amazing, great house, great host, perfect for family time with all amenities. The Villa had everything you could possibly need to enjoy, even a zip line! It look like the owner really cares. The host David was super. One of my best experiences in AirB&B. The house is even more impressive in person, if possible, than in the photos! Totally recommended! Everything in detail and we could not be more comfortable. We would repeat without a doubt !! Very well designed, spacious and modern! The exterior is very spacious and has many activities and games for both children and adults. It looks great on the photos and even better in real life. Daf was very hospitable and easy to contact. The area is very picturesque and is close to the coast. The house is modern and clean everywhere. The bedrooms are spacious, well designed and 2 bedrooms have their own balcony overlooking the sea, which was lovely! There are plenty of seating inside and outside, a well-equipped kitchen and the bathrooms have a rain shower and a Jacuzzi. The property is safe and the grounds are huge, completely fenced and well maintained. The pool is great and comes with everything you could possibly need. I would recommend Daf and his beautiful home to everyone. We hope to come back soon!